India’s leading Mobile service provider Reliance Communications (Rcom) is all set to offer FREE (at zero upfront cost) 16GB iPhone 5c and iPhone 5s with fixed monthly payment of Rs.2500 and Rs.2800 up to 2 years. According to Hindu Business-line Report, Reliance will offer unlimited voice calls, SMS and 3G data (we expect these all will be with FUP) for a fixed monthly charges between Rs.2500 and Rs.2800 up to 2 years. 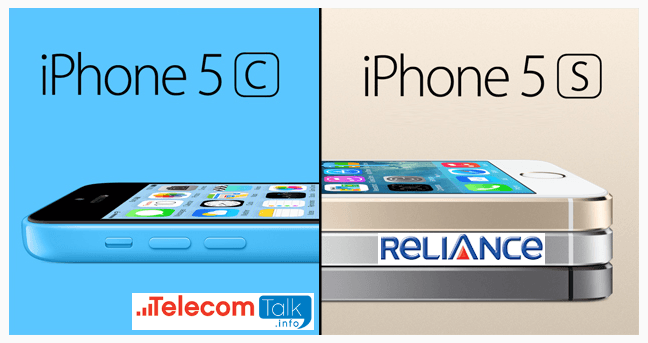 The iPhone5S and iPhone5C subscriber will be locked in to RCom’s network under a two-year contract. RCom – iPhone offer will be available to credit card users only with its offer partner banks, including ICICI Bank and HDFC Bank due to safety reasons. RCom spokesperson officially declined to comment on this offer, but sources said the Reliance and Apple will jointly announce the offer today evening. With this scheme, the 16 GB iPhone 5c, priced without any subsidy at Rs. 41,900, will be available for a monthly fixed charges of Rs 2500 while the 5s, priced at Rs 53,500, will be available at approx fixed monthly charges of Rs 2800 per month. The 32GB version of iPhone5S will come with an upfront charges of Rs 10000 in additional of monthly contract pricing. The 64GB model which costs at.Rs 71,500 without the offer, will be available with 2 year contract scheme for an upfront fee of Rs 18,000 plus monthly charges with Freebies of Call, SMS and 3G data usage. But dear, they are also offering unlimited Voice calls and Unlimited Texts throughout those 2 year contract, so in case you pays out a monthly billing of Rs. 1000 that would cost you 1000X24 = 24,000, so paying Rs. 20,000 as Interest would have a net profit of Rs. 4000/-.